Cromard® cylinder liners are manufactured using the latest manufacturing technology and quality assurance equipment under an ISO 9002 quality system to ensure that a product of consistent high quality reaches the customer. 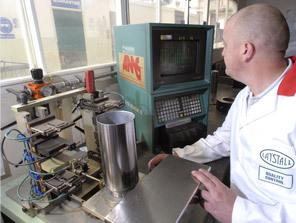 World Class techniques, including Cell manufacture, are used along with Continuous Improvement methods to ensure that all aspect of the manufacturing process are optimised. In order to assure our customers that the product they are purchasing is of genuine Laystall origin and therefore subject to our rigorous quality regime, each cylinder liner is shipped with a high security foil hologram attached to the internal packaging.